Harper Lee and E. L. James walk into a bar . . . The second attempt came to light, as with Lee’s attempt, through the filing of an opposition to the author’s registration for trademark rights in their book’s title. Designer Micah Cohen is opposing E. L. Jame’s application for registration of “Fifty Shades of Grey” as a mark (through Fifty Shades Limited). Micah is claiming that he already has common law trademark rights in a confusingly similar mark (“Shades of Grey”). So why seek trademark protection for a book title? Or for fictional character or location names? The most obvious answer to that question is merchandising. For example, if you look at just about any product that has anything to do with Harry Potter, you will probably see a little “TM” buried in there somewhere. That “TM” symbol says that the producer of that item is claiming that word, name, symbol, or whatever is being used as a trademark. 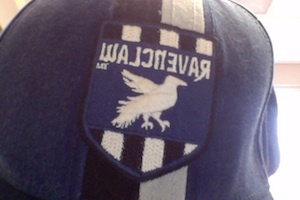 I have a Ravenclaw hat from my trip to the Wizarding World of Harry Potter. The embroidered crest of Ravenclaw House actually has a little “TM” in the crest itself. I don’t remember that from any descriptions in the book . . . . Trademarks rights can be easier to enforce against knock-off merchandise. Asking whether a hat with a Ravenclaw crest on it infringes the copyright in Rowling’s books (or the movies) may not as straight-forward a question as the rights owner would like. However, if the word “Ravenclaw” or the image of the Ravenclaw crest are trademarks (that is they indicate the source of the hat), then enforcement is a much clearer question. We see this concern in both the Harper Lee and the E. L. James situations. With “To Kill a Mockingbird,” some have at least speculated that one of the reasons Harper Lee has sought trademark rights in the title of her book is that she may be tired of the museum being the one, and not her, making money off “To Kill a Mockingbird” t-shirts and other memorabilia. In the case of E. L. James, Fifty Shades Limited has been very aggressive in exploiting and protecting the Fifty Shades Brand. A second possible explanation for the increased use of trademark protection may be that it is a necessary by-product of cross-media technologies. What I mean by that, is that the current technological environment makes it possible for an author’s fictional characters and world to exist not only on the pages of a published print book, but also on a website or in a fake social media account for the character or in a book trailer or on fan created wiki or in fan fiction. Each different media channel represents a further means for the author to explore the character and express themselves as an author and for the author to generate revenue from the original work (either directly in the new media or indirectly through book sales). At the same time however, each different media channel also represents an avenue through which the author could lose control over aspects of the work, both creatively and economically. Now, I don’t mean to suggest by those possible explanations that copyright protections would not be enough in those situations. I’m not saying that an author could not use their copyright to shut down a rogue fan site. I’m merely saying that trademark potentially adds another weapon in the author’s arsenal. As an example, recall the suit between Rowling and the publishers of the Harry Potter Lexicon. Rowling won the suit, eventually, but the court’s language left open a lot of possibilities for future cases. But getting trademark protection . . .
With trademarks, however, authors have to do something more to obtain trademark rights. They have to use the mark in commerce as a mark. In other words, they must use the name of their character or the title of their book as an indicator of the source of a product or service. This means an author has to use it in some way different than simply having written and published a book with that title or containing that particular character. Like copyright, registration is not necessary for obtaining protectable rights in a trademark, but, also like copyright, registration confers significant advantages (that I won’t go into in this post). Additionally, authors can run into problems of having their potential rights in the trademarks they seek blocked by trademark rights already obtained by others. That may end up being the case for both Harper Lee and E. L. James, though the actual questions involved in both of those situations are fairly complicated (both legally and factually). What’s the take-away on trademarks for authors? Well, they may not be necessary in most instances, they may be helpful in some, and they may or may not be worth the effort needed to actually obtain. Hey, I’m a lawyer – sue me.